I am thinking Tapas! In Vienna, Va there’s this amazing little place called Maple Ave Restaurant. My girlfriends and I often meet there for a girl’s night. One of our favorite tapas on their menu is their heirloom beet salad. Recently, I hosted a bridal shower for one of the girls at my house and I was so excited to show her how I recreated our favorite salad. Is party season upon you? Enjoy a girl’s night in with Tapas and serve this colorful salad to WOW your girlfriends. Slice all of your veggies. On your serving platter, spread out your salad greens. Create an assembly line with sliced veggies. Start with your tomato on the bottom, slack your veggies with a slice on goat cheese in between in section. 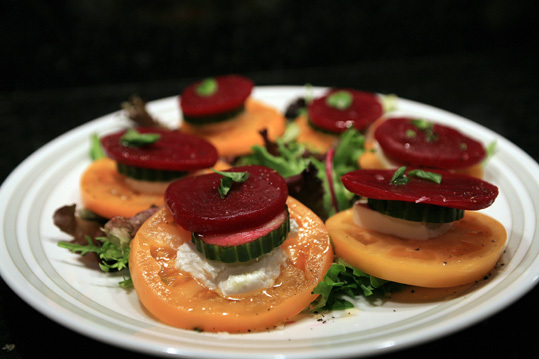 The order should go like this from bottom to top: tomato, goat cheese, cucumber, goat cheese and beet. You can use a tooth pick down the middle to secure all the veggies together. Place each stack on your salad greens. Season the stacks with salt and pepper and finish with a drizzle of olive oil. ** Note: The dish we love is garnished with Himalayan Sea Salt. This salt has a gorgeous pink color. If you can find it, pick it up and garnish this salad with it. It really makes the dish perfect. Enjoy! Did you recently make a golden beet verison of this at a recent bridal shower? If so, I would love the recipe!